We’d love your help. 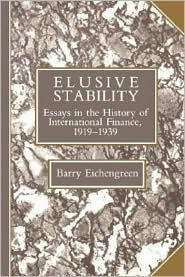 Let us know what’s wrong with this preview of Elusive Stability by Barry Eichengreen. To ask other readers questions about Elusive Stability, please sign up. Barry Eichengreen* is the George C. Pardee and Helen N. Pardee Professor of Economics and Professor of Political Science at the University of California, Berkeley, where he has taught since 1987. He is a Research Associate of the National Bureau of Economic Research (Cambridge, Massachusetts) and Research Fellow of the Centre for Economic Policy Research (London, England). In 1997-98 he was Senior Barry Eichengreen* is the George C. Pardee and Helen N. Pardee Professor of Economics and Professor of Political Science at the University of California, Berkeley, where he has taught since 1987. He is a Research Associate of the National Bureau of Economic Research (Cambridge, Massachusetts) and Research Fellow of the Centre for Economic Policy Research (London, England). In 1997-98 he was Senior Policy Advisor at the International Monetary Fund. He is a fellow of the American Academy of Arts and Sciences (class of 1997). Professor Eichengreen is the convener of the Bellagio Group of academics and economic officials and chair of the Academic Advisory Committee of the Peterson Institute of International Economics. He has held Guggenheim and Fulbright Fellowships and has been a fellow of the Center for Advanced Study in the Behavioral Sciences (Palo Alto) and the Institute for Advanced Study (Berlin). He is a regular monthly columnist for Project Syndicate. His most recent books are Exorbitant Privilege: The Rise and Fall of the Dollar and the Future of the International Monetary System (January 2011)(shortlisted for the Financial Times and Goldman Sachs Business Book of the Year Award in 2011), Emerging Giants: China and India in the World Economy, co-edited with Poonam Gupta and Ranjiv Kumar (2010), Labor in the Era of Globalization, co-edited with Clair Brown and Michael Reich (2009), Institutions for Regionalism: Enhancing Asia's Economic Cooperation and Integration, coedited with Jong-Wha Lee (2009), and Fostering Monetary & Financial Cooperation in East Asia, co-edited with Duck-Koo Chung (2009). Other books include Globalizing Capital: A History of the International Monetary System, Second Edition (2008), The European Economy since 1945: Coordinated Capitalism and Beyond (updated paperback edition, 2008), Bond Markets in Latin America: On the Verge of a Big Bang?, co-edited with Eduardo Borensztein, Kevin Cowan, and Ugo Panizza (2008), and China, Asia, and the New World Economy, co-edited with Charles Wyplosz and Yung Chul Park (2008). Professor Eichengreen was awarded the Economic History Association's Jonathan R.T. Hughes Prize for Excellence in Teaching in 2002 and the University of California at Berkeley Social Science Division's Distinguished Teaching Award in 2004. He is the recipient of a doctor honoris causa from the American University in Paris, and the 2010 recipient of the Schumpeter Prize from the International Schumpeter Society. He was named one of Foreign Policy Magazine 's 100 Leading Global Thinkers in 2011. He is Immediate Past President of the Economic History Association (2010-11 academic year).